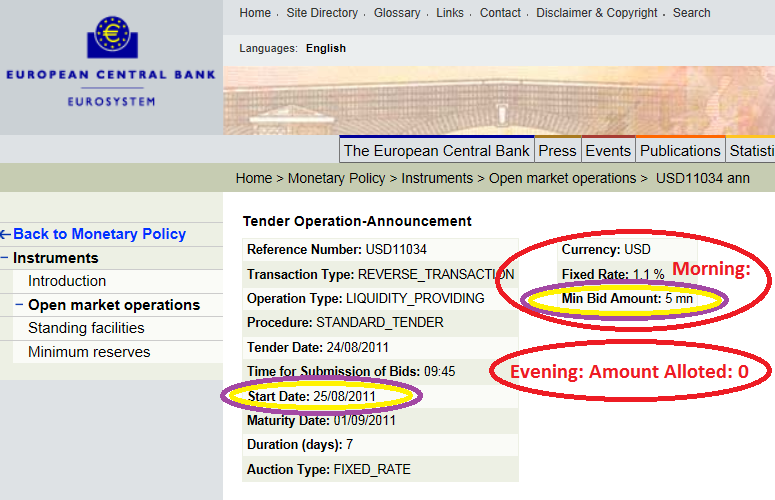 This Tender Operation-Announcement, Reference Number 11034 means that $5m were provided on morning August 25 from ECB to a German bank otherwise this bank was in default, but not allowed, because, finally, this bank found these $5m some hours later. 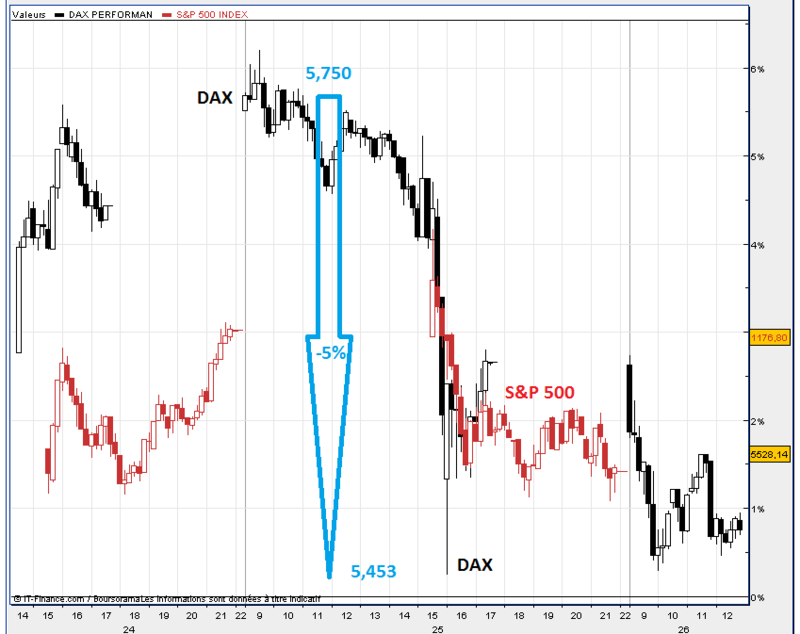 Indeed, to avoid this event, she was able to sell some assets in panic during trading session, which abnormally lowers DAX: it fell from 5,750 (morning) down to 5,453 at 4 p.m., i.e. 5% on August, 25! Conclusion: my paper is correct: a (German) bank was still in default of payment on morning August 25! This is the cause of 11034. On previous week (11033), this bank could not find on the markets $500m which she needed. Le scénario du pire : la Grèce en défaut de paiement, etc. BNP : cocorico couac ! I was watching Bloomberg when this happened and the commentator was saying there was 50,000 contracts of the DAX futures sold in 15 minutes. That is an amazing sum of money of around €7.25 billion, notional. I wonder if this the beginning of another round of huge equity losses globally like we saw in Q4 of 2008. In any event it appears there are serious problems all over Europe and not just France. Are there serious problems in Unicredit and other German & Swiss banks as well? I’m sure the Spanish banks are also in serious troubles. The Greek banks are pretty much insolvent. The large US banks are in trouble as well as you can tell from the collapse of BAC despite Buffet’s investment. They are holding so much bad mortgage investments and since the US financial reporting mechanisms have been distorted since TARP no one really knows what they are holding.